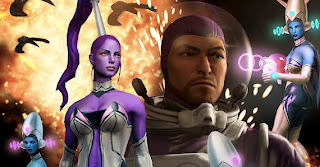 Saints Row: The Third 'Gangstas In Space' is here! The next add-on for Saints Row: The Third is here with Gangstas in Space. If you've got the Season Pass for the game, you can simply download the new content, otherwise it will cost you 560 MSP ($7). Check out the trailer below, and queue it up if you wish to buy it! "If you own Saints Row: The Third Season Pass DO NOT purchase this content here as you will be charged again. A new movie is being shot in Steelport and you're the star! Join with your co-star, Jenny, to fight the alien invasion for the film Gangstas In Space. With spaceships and alien weaponry, this retro-style film is sure to be a hit! Saints Row: The Third game required; sold separately."